A match made in heaven: Garage sales and credit cards! If you are just finally starting to recover from the Christmas spending frenzy, and from spring break, you are not alone. In fact, these days all you see all over social media are articles to help people dump those credit card’s charges accumulated during the holidays. If you are one of the few smart people that budgets for your entertainment in advance, you can stop reading now. However, if you are one of those average people that added about $700 onto your credit cards during those days off, read on. Here in this article we wanted to suggest a practical idea to get rid of those few hundred dollars added to your credit card. Do you see where are we going with this? You got it! a garage sale! A garage sale is a great idea to make a quick buck to help you pay off debt. We at Saving For Hope believe that making money takes arduous work, and keeping it for the purpose of building wealth takes even more effort. That is why a quick garage sale to help you start the summer on track to get rid of those credit cards once and for all it’s a match made in heaven. In fact, did you know that nationally, a well planed garage sale can bring an average profit of $500.00? That is not bad for a few hrs. of work, organizing, pricing, and cleaning the garage to fit your car in it, on a Saturday morning. Here are our suggestions, so you can be successful and realistic at the same time. No, a garage sale is not going to pay for ALL your debt! If you think that is what we are suggesting, you will be disappointed. However, a garage sale can give you a good head start on the process of being debt free! After you think about it for a few minutes and decide that it is a great idea, let’s jump into a few things to consider, to maximize your Return of Investment. Sell everything but your kids and pets! Seriously, if you have not used it for quite some time, sell it. There is no point of having stuff sitting in a garage that is just collecting dust for years. Sporting items are usually the biggest dust collectors. Action: 1- Walk around your house and start assessing what you have and how much you can get for it. 2- After you have assessed everything, organize it and price it. Price your items right. Remember that you have, on average, about 2 minutes to catch your customer’s attention. If the items are not organized well, and priced right, they will leave. The longer they stay, the better chances that you will get their money. Action: 1- Price your items prior to having the garage sale. 2- Tip: for smaller items, you can use a table and put all the small items together, and price the entire table (like everything for $1, etc.) that way you don’t have to price each individual item. It is all about presentation. In fact, here are the 4 biggest turn offs you want to avoid according to national data (by percentages): Overpriced Items 43%, Disorganization 22%, Dirty Items 19%, and Hard to Find 14%. Pricing them right and a good organization, will impact your potential customers. Action: 1- Organize every item by categories. 2- Tip: if you have furniture and large items, display them together on the yard (a la IKEA!) to let your customers see how it will look in their homes. You can have fun with kids with this, so get creative! 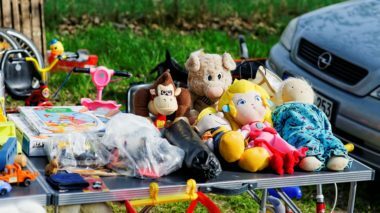 There you have it, a few tips to make your garage sale a profitable one, so you can pay off that stubborn credit card debt. We can even take it a step further, if you are one of those people paying a monthly fee for a storage unit, because you have so much “stuff”, get rid of both at once! Get rid of the monthly fee and use that to pay down your debt, or invest it to make more money, as you make some extra cash to help get rid of the debt. Finally, this is a great family activity that can serve as a “financial teaching moment” for the kids! A win-win if you ask us! Believe us, it won’t make you rich, but it will help you achieve financial freedom. If you decide this is a good plan for you, drop us a comment and let us know how it went, how creative you got with the kids, and what you did with the money. We will love to hear from you. Enjoy! ← What Colleges and Universities don’t want you to know!